Well firstly, let us congratulate you on a very good career choice! Every home and business needs an electrician, whether or not they choose YOU, is down to how you study, train and develop your skills from the very beginning of your career. We hope this blog is a useful guide for any young (or old) budding electricians. We have recently done a job for Leicester Tigers Rugby Club – fitted some new Dimplex heaters, much to the excitement of some of our team who are Tiger fans! Energy bills can be confusing things, just what is a kWh? Now we know that different energy companies set their bills out slightly differently but there are some essentials that should be the same on each bill. This blog hopefully will help clear things up a bit! 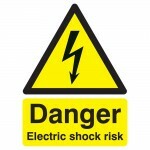 Electrical mishaps, the weird and not so wonderful! We all know how dangerous electricity can be, even to those with the proper training. Here’s a look at some electrical accident statistics and a few very unusual incidents that have happened across the globe.